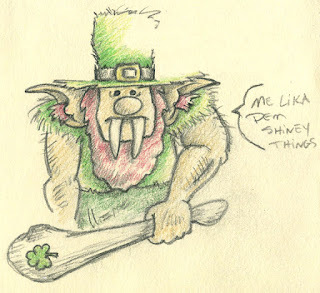 I didn't have time to sketch something custom for this topic and then I remembered that I sketched this while I was designing Leprechauns in March. Hey fairy folk had to evolve too. Thanks for all the comments last week. Here's a quick sketch for Illustration Friday. I kept thinking about wardrobe malfunctions when I considered this word. Also, I think you can see why I cartoon animals instead of babes. :) Oh well, I've got some time to practice now. In fact I'm going to revamp my website to include a better shopping experience for my patrons and add a section to sell my new note cards.